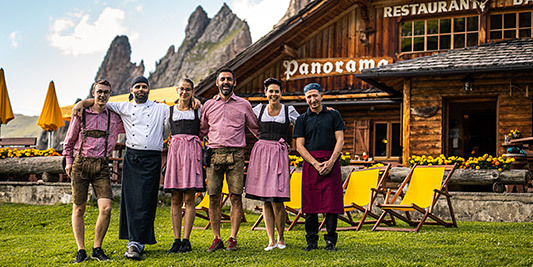 Panorama Hut is situated in Selva di Val Gardena near the Passo Gardena at an altitude of 2130 meters. Open in summer and in winter. From the end of June to September and from December to Eastern. 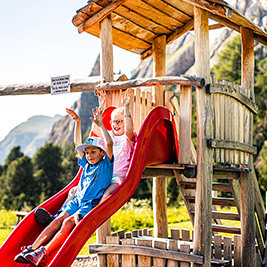 Tyrolean specialties, homemade cakes, sun terrace, children‘s playground. 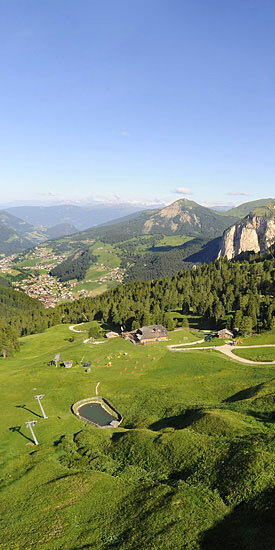 Reachable in 5 minutes from the middle station of the cable car Dantercëpies and in 30 minutes from Passo Gardena. You can reach the Rifugio Panorama from the topstation of the Dantercepiescableway in 15 minutes, from Passo Gardena in 30 minutes or from Selva in 1hour an 20 minutes. The hut is situated on the way number 12A. 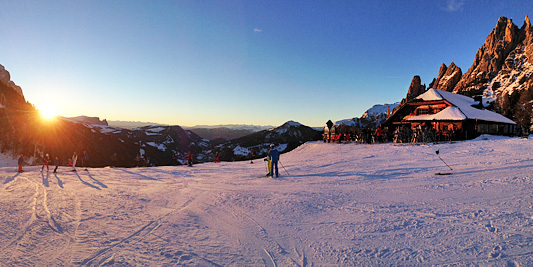 Panorama Hut is situated on the Dantercepies skislope direction Selva Gardena in the Sellaronda. 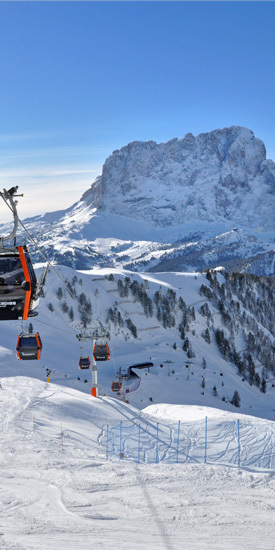 The Dolomiti Superski area has 450 lift facilities and 1,200 km of slopes. 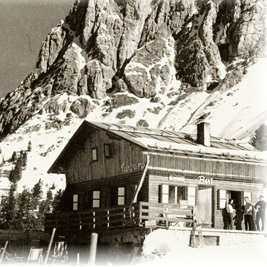 The mountain hut Panorama was built in 1963. Since then it's managed by Otto Mussner and his family. Our kitchen serves traditional tyrolean plates and not only. A group of 27 of us had lunch at the Panorama whilst on a trip to celebrate a 50th birthday. Most of the group were skiers so had no trouble reaching the restaurant but for the few non skiers amongst us the restaurant manager very kindly picked us up from the middle station and gave us a lift over on his ski-doo. It is walkable, but very steep as you would expect! The staff were very friendly and the lunch tasty. The fog moved in which was a shame as we couldn't see much of what would have been a fantastic view but the restaurant owners laid on accordion music and singing which kept us very entertained! 5 Years now we have been going to Selva skiing and I can honest say you wont find a better mountain restaurant, believe me we have tried them all. The food is great quality at great prices BUT what makes this place is the staff. They are warm, friendly and always have a smile. The music's not bad too either. Everything on the menu is good but my favourite would be their Goulash. This is a must stop. Thanks for another great time and we will see you again next year. We spent a week skiing in Alta Badia area. One day we decided to have a break for some refreshments in this Hütte Panorama. We ordered gnocchi and a torte de sarasena made with buckwheat (sorry if the name is misspelt). Both tasted really great. You couldn't believe that the gnocchi was made from potatoes! The torte was warm and came with whipped cream. I've never tasted it before but it was delicious. The staff is dressed in traditional costumes, which look really nice. But the biggest reason why I give full points is that the young waitresses never stop smiling! And the smiles are genuine. Go visit and see for yourself! Been skiing in Val Gardena for 4 ears now. Must stop for lunch is Baita Panorama. The food is lovely, simple, warm and very tasty. The service is good the staff are friendly and the views lovely. An added bonus is the music played over their sound system makes for a great atmosphere all round. Absolute, definite must try. 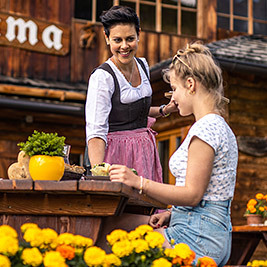 We stopped at Panorama quite a few times to have lunch or just enjoy a Weissbier. It's perfectly located next to the Dantercepies lift. The traditional South Tyrol food is excellent (goulash, knedli, deer, etc) and the service is friendly and efficient. Highly recommended.